Can we expect another war of words between Shahid Kapoor and Kangana Ranaut for their movies are expected to clash at the box office? We still remember how these stars didn't get along during the shooting of Vishal Bharadwaj's Rangoon. It all started when Kangana narrated her 'nightmarish' experience of sharing a cottage with Shahid Kapoor and that kissing him in some scenes felt disgusting. Though the stars insisted that all is well between them, those cold vibes were hard to ignore. And we wonder if their history will repeat itself in this case. 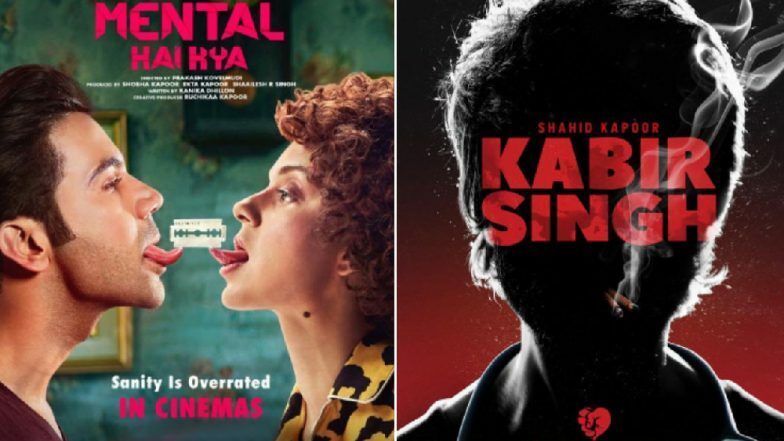 Mental Hai Kya: Kangana Ranaut and Rajkummar Rao Starrer Gets a Quirky New Poster, Movie to Release on June 21. Kangana is currently gearing up for her next release, Mental Hai Kya with Rajkummar Rao. The release date of the movie was pushed because she got occupied with her directorial duties for Manikarnika and couldn't shoot for the other project. However, now that everything is back on track, the makers have finally announced its new release as June 21, 2019. Mental Hai Kya will now lock horns with Shahid Kapoor and Kiara Advani's Kabir Singh, which is a remake of Telugu movie, Arjun Reddy. Shahid Kapoor’s Rowdy Avatar in Kabir Singh Was No Cake-Walk, the Teetotaller Smoked Almost 20 Cigarettes a Day. It would be interesting to see Kangana Ranaut and Shahid Kapoor battle it out at the box office and we are curious to know who will have the last laugh. Do you think Ms Ranaut will be able to beat Sasha hands down? Or will it be the other way down? Let's wait for time to decide that.